I want to thank you for the opportunity to address the Board. 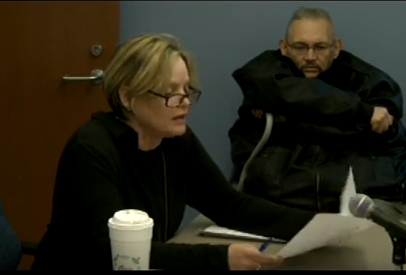 I was not able to attend the November town meeting when the issue of the proposed DPW sites was discussed. But I understand only about 140 or so townspeople attended the meeting, so there are likely many residents like me who were unaware, and may still be unaware, of this issue. A number of people have recently brought this to my attention and have expressed concerns about the Wolf Swamp Field site proposal in particular and, as importantly, about the process that is being used to develop a proposal and keep residents informed. Most residents including myself understood both votes to approve funds for the DPW project were to further analyze the 3 sites- Grande Meadows, Wolf Swamp and the current site. Is that the case? or is the DPW task force moving forward with the Wolf Swamp site only as the site? That also raises the question of the current task force town resident members? There should be representatives from members of youth lacrosse, soccer, baseball and Wolf Swamp Field abutters as they are stakeholders of these fields. I think these process items are important since so few residents were at the town meeting, and only very high-level information was shared about the selection and scoring process. What are the key dates in terms of when critical decisions will need to be made? What town votes will be required and when? Which committees are involved in the process, who has primary responsibility, and who are the members of the various committees? How residents will be kept informed of discussions, and what opportunity will be provided for resident input? Are the various committee meetings open to the public? How will this be shared with residents? Is there opportunity for additional resident representation? What would that process be? I know the town residents approved funds to evaluate multiple DPW sites. For the May town vote, will the committees be presenting the results for just 1 site, or will results be shown for 2 sites and the current site? Thank you again for the opportunity to address these issues, I look forward to the answers from The Select Board as there are many questions that the public needs to know to be able to vote for the funds to builds new DPW facility. While we appreciate the work done by the Task Force and Stephen Crane, Town Manager and Chairman of the Task Force, we learned that there has been no public notice of its meetings, no public agenda and no minutes taken or reports made available for review by Town residents other than the power point presentation used at the November Town Meeting. While we were told that the Select Board recently voted to change the Task Force to a Committee, which would be subject to the Open Meeting law, we would have preferred a more transparent process which was open to the public from the beginning. No one doubts the need for a new DPW facility. However, the proposed Wolf Swamp location which is the top site choice of the Task Force would involve the taking significant field space (20-25% as Crane has stated) used by hundreds of kids for soccer, baseball and lacrosse. 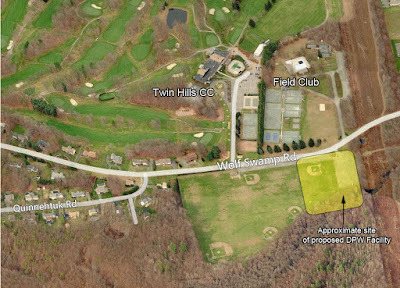 Field space in Longmeadow is at a premium and the removal of almost one quarter of the Wolf Swamp field space undoubtedly would create hardships and scheduling issues. We believe that the Wolf Swamp site would significantly detract from the aesthetics of the Town. 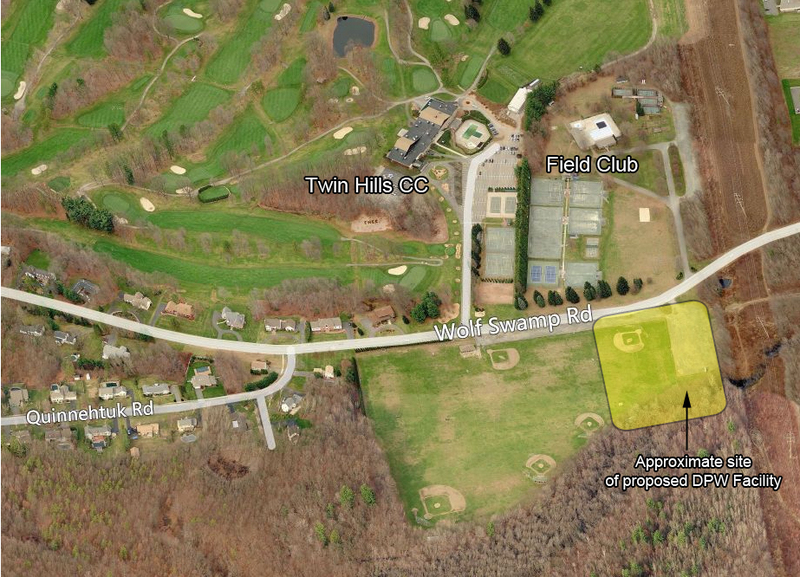 Should this site be selected, a beautiful section of Town which is currently “green”, with soccer/ lacrosse/ baseball fields, The Field Club, Twin Hills Country Club and nearby residential areas, would be home to a large “industrial” facility. Regardless of efforts made to make the building attractive, the proposed new facility would be home to 30 trucks and other equipment, salt shed, fuel island and multiple bulk storage buildings. The facility also will contain a large paved parking lot. There is no doubt that this clearly would be a commercial/ industrial site incompatible with its surroundings. In addition, we believe that this project should not be considered in isolation. The Select Board has endorsed a new senior center as a priority and funding for design work has been approved. In addition, the School Board may seek funding for a new combined middle school. Improvements in water and sewer lines are needed. We believe that these projects should be considered together and prioritized with input from town residents since, after all, the projects’ combined costs will be substantial as will be the tax revenues needed to pay for them. In closing, we respectfully suggest that the Select Board and the Task Force/Committee consider other available options, including the current DPW location, before a final decision is made and voted upon.